Geeta Boodhoo, 32, who was unable to walk after injuring her knee in an accident at Sisters Village, West Bank Demerara on May 16, has undergone surgery successfully and is currently undergoing therapy. The surgery was done at the West Demerara Regional Hospital, where she was admitted a patient. She was discharged from hospital a few days later. Social workers who are involved in her case have placed her in a home in the city where she is recuperating. When this newspaper contacted her, she said she felt confident that she would be back on her feet in a few weeks. On May 16, around 9 am, Boodhoo was struck from behind by a speeding motorcar and pitched into a nearby trench. At the time, she was taking two of her children—Jonathan Joseph Franklyn, 8, and Varshanie Boodhoo, 10—to the Wales Primary School, where they were expected to start the following day after seeking a transfer. Fortunately, the children were not injured. The driver, Otis Isaacs, 20, of Albouystown, Georgetown, was slapped with four charges at the Wales Magistrate’s Court. He pleaded guilty and paid a fine for all of the offences. Boodhoo, a mother of five, also sustained severe injuries to her abdomen. Her two-year-old twin daughters have been placed in the care of a brother while the three older children are at the home of a friend. 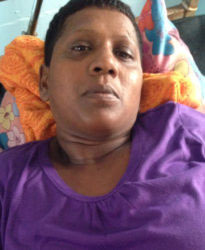 Boodhoo was rendered disabled on December 16, 2014 when her left hand was chopped off, allegedly by her former reputed husband, Joshua Franklyn. During the chopping spree at the Tuschen, East Bank Essequibo home where he had lived with Boodhoo, the cane-harvester who turned 45 on the same day of the incident, allegedly killed her mother, Zalima Khan, 55; her daughter, Ashley, 9; and a friend Floyd Drakes, 30. He and his son Jimmy Franklyn, 20, have since been charged. Boodhoo, who had worked as a waitress, sustained severe injuries to her head, neck and shoulder and it was while barring the chops that her hand was severed just above the wrist.